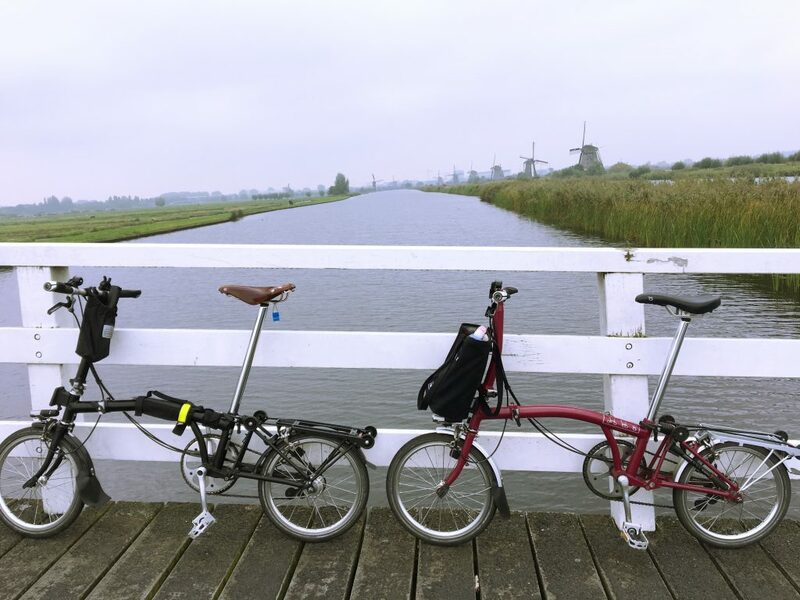 Pedal-powering our way through The Netherlands was a joy! Cycle paths lead everywhere and motorists actually stop for cyclists at intersections. Pier never got used to that last one. Every time when we had the right of way, he’d stop for the motorist, who would look at us in confusion and motion us through, like, “Why are you stopping? Go!” So we’d cycle past and give a sheepish smile that hopefully conveyed the fact that we were from a country where exercising right-of-way on two wheels is physically dangerous and not something we’re accustomed to doing. 1 – Use a map app with GPS. 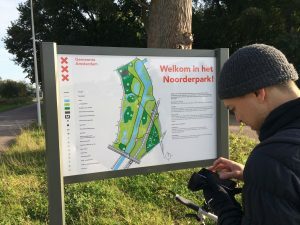 Experienced cycle tourists know all about how maps work offline with GPS, but this was our first time! We didn’t know! Cycling out of Schiphol Airport would have been much easier if we had. Luckily, we soon figured out that if we downloaded a Google map of where we were going that day (for example, Amsterdam to Waterland), the handy “you are here” blue dot works via GPS! No need for a data plan! Another option is Ulmon’s CityMaps2Go. Not only does the handy “locate me” work offline, you can mark attractions and all kinds of other stuff. We used this app later in our trip, but I’m definitely planning to use it more in the future. Bonus Tip: TRUST THE BLUE DOT! At first, we thought the GPS was mistaken. We couldn’t possibly be on that street! But we were. We always were. Roads in Europe don’t go straight and even people with the best sense of direction can easily get turned around. 2 – Plan to get lost. Pier consulting maps – physical AND digital. This is something sooooo many people told me before we went to The Netherlands. Thing is, I’m an A-type planner; wandering around getting lost is not my idea of a good time. Plus, I have a great sense of direction and decent map reading skills (the Junction Route System notwithstanding). So I did not plan to get lost, and truthfully we didn’t, not for more than a few minutes, but I still should have allocated more time to get around. Why? Because even if you know which way to go, even if you read the signs properly, there are SO MANY cycle paths that an intersection isn’t a simple “go straight or turn” situation – usually there are multiple paths veering left or right or straight-ish. Basically, unless you’re a local who knows exactly where you’re going, you’ll need to stop and get your bearings, and that requires extra time. This really came into play as we were biking from Zandvoort to Leiden. It took us 30% longer than I anticipated because of how often we stopped to consult signs and our GPS. So even if you’re not wandering aimlessly through the countryside, you should still plan for the ride to take longer than expected and allocate “getting lost” or “map consulting” time to your schedule. 3 – Take advantage of train lockers. Most train stations have lockers. It doesn’t matter if you’re taking the train or cycling from town to town, you can use these lockers to store your bags while you sightsee. There are small, medium and large lockers. Prices are for a 24 hour period. We managed to get all of our bags (two 30L backpacks and two B-bags) into one medium locker. If we’d wanted to leave our Bromptons, we could have fit them inside a locker too. 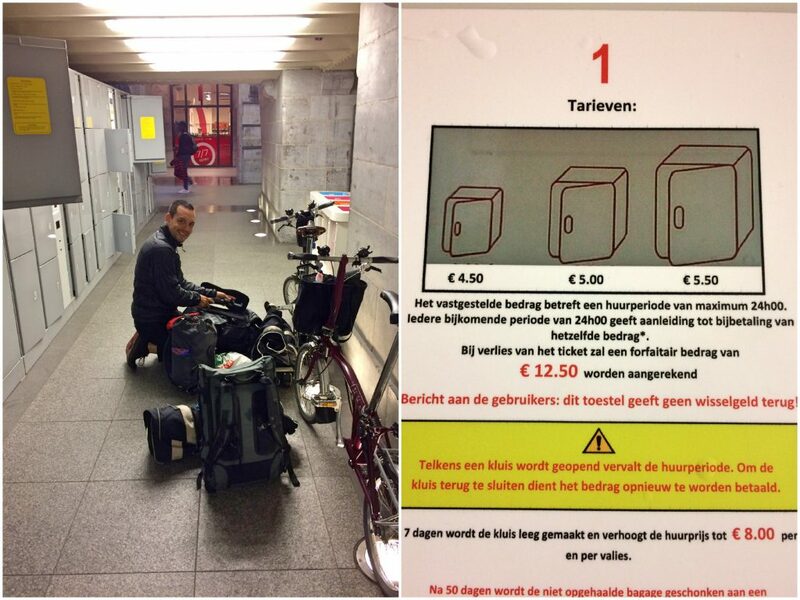 These pics are from Antwerp station in Belgium, but you get the idea. 4 – Don’t bother looking for water fountains! In Cuba we knew we had to carry enough water to last us an entire day’s ride, but we assumed it would be easy to get water in The Netherlands. Like in Canada, the Dutch probably had lots of public water fountains in parks and bathrooms, right? Wrong! We only came across ONE foundation during our entire trip after riding for 40 minutes through a national park. I think it was the only fountain in the whole place! 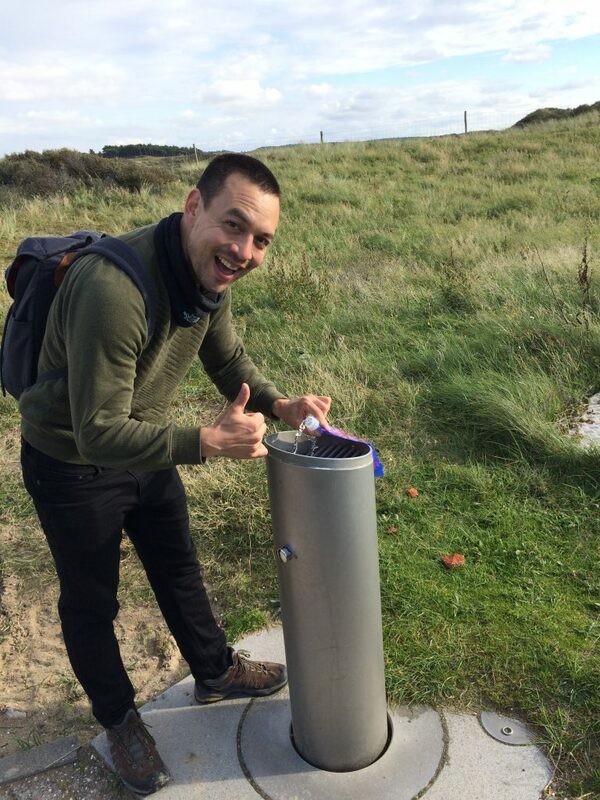 Since water fountains are not a thing in The Netherlands, make sure you bring enough water bottles with you or plan to stop where you can buy water. 5 – Get food at Albert Heijn! What’s that? A restaurant? Fast food? Nope, just a grocery store chain. 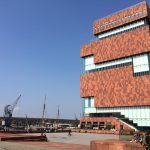 But it has tons of cheap, healthy food to grab on the go, such as pre-made salads (usually at least a dozen kinds), sandwiches, snacks, fresh bread, fruit and veggies, and of course Stroopwafels. Albert Heijn stores are a cycle tourist’s best friend! Our faves from Albert Heijn: salad bowl (comes with free reusable spork! 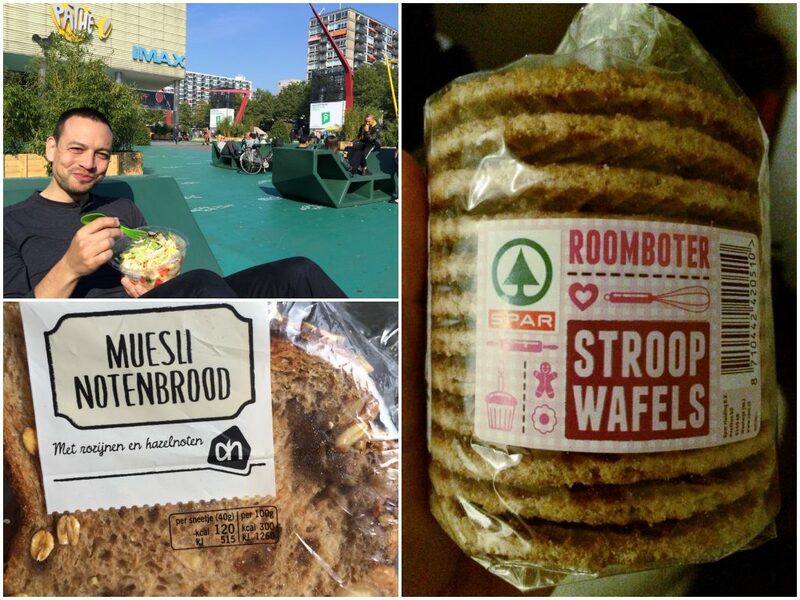 ), Muesli bread, and Stroopwafels. 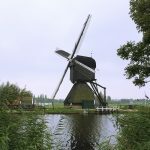 So those are my tips for cycling in The Netherlands. If anyone has others, leave them in the comments!